In the fall our cottonwoods are bowing under the weight of literally hundreds of turkeys that are congregating for the winter. So, envision this.......Before light you are sitting in a blind under a 200 bird roost, waiting for flydown. 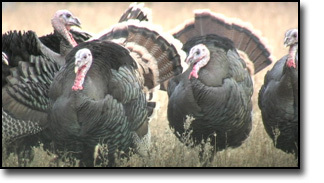 By 8:30am you've got your turkey and you are on your way to to the CRP fields to shoot a limit of pheasants! Where else can you get a combo like that other than at Prairie King Wingshooting?